Tall people generally look better in clothes. But they have clothing issues too. Here are some of the more common ones, and how these problems can be fixed. Every t-shirt, sweatshirt, and sweater you try on that isn’t deliberately oversize ends up exposing your stomach. It’s as if they shrank in the dryer. The fix: Of course, you cannot make the tops longer. What you can do instead is switch over to higher-rise jeans and skirts that fit at your natural waist. This will bridge the gap. Crop tops always end up looking way sexier than you want them to. At some point, it might even turn to lingerie. The fix: Once again, try a higher-waist bottom as this will reduce your exposed midriff. Go for boxier crop tops if you are still uncomfortable. Layer them over longer blouses and camisoles. You will get the waist-defining advantages of a crop top without showing your stomach. Is This a Top or Dress? 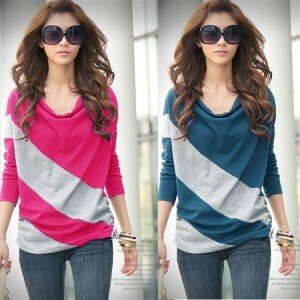 Sometimes, we get confused with an outfit – we cannot decide if it’s a top or a dress. Perhaps if you wear it with tights and keep your arms still at the sides, no one will know that your bottom is an inch away from falling out the bottom. The fix: If you really want to wear it, you can either tie a sweater or long-sleeved shirt around your waist to give yourself a little more coverage in the back. Alternatively, if your dress is not too bulky, you can just tuck it into a skirt and wear it as a top. It will be long enough and won’t untuck easily. Tops and blouses never stay tucked in. The fix: The answer could, once again be high-waisted pants and skirts. They will hold the shirt better, and will also make your legs look longer. In fact, they can look really obscene. The fix: Luckily, you can easily find midi skirts now. Yes, they probably look somewhat conservative on a shorter girl, but on you, they will look cute. On tall people, pants might look small. The fix: Go for slim, tapered styles if the brand you love does not offer longer lengths. 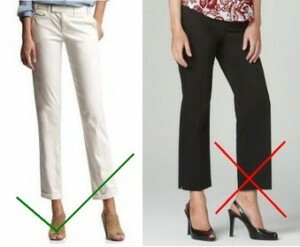 Don’t wear anything that flares out at the bottom, such as a boot-cut or bell-bottom. So even if your pants aren’t quite as long as you would like, at least it won’t look like you bought them before your last growth spurt. Tall people have big legs. Shopping for them can be a problem as it may be difficult to find the right size. The fix: You may not find them at brick-and-mortar stores. Try online. If you are thinking of a new brand, first visit the store in person to try on any shoe they may have in your size. This will give you an idea of how they fit before you actually buy them.